The DSX100 is a free angle wide zoom microscope with 16x zoom optics for a new generation of inspection and measurements. Employing four segment-LED ring light, this scope ensures high inspection performance. The DSX100 provides a new way to see. No need to look through eyepieces, everything you need is on the screen. Operate the scope with a touch panel or mouse. What's more, virtually anyone of any experience level can use this interface to achieve their results in seconds. The system guides the operator from inspection to measurement to analysis to final report. Short, simple steps. Quick results. Select Tutorial, Operator or Advanced Mode to best match the experience of the operator and the job at hand. Operator Mode can be customized to speed up routine work. The operator's ID and password open the application, and automatically sets the system to the operator's preferred configuration, observation, analysis, and measurement settings. Even first-time users can follow the suggestions of the system and it will create the image that meets their needs. Provides the flexibility and power advanced users need while retaining an intuitive and simple to use interface. This customizable mode is ideal for routine work by eliminating all non-essential menus. In the past, an operator had to make complicated adjustments on their microscope to achieve their desired image; with DSX100, it's simple. 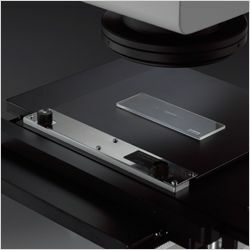 Once the sample is in place, everything is controlled by touch screen or computer mouse - focus, zoom, brightness and light position. All controls are direct and easily performed. In addition, auto-focus and auto-gain ensure illumination and focus are correct. Changes in magnification can be made as needed, even by small amounts. The DSX100 lens system provide a 16x digital zoom for a maximum magnification of 30x. With conventional microscopes you have to move the sample in order to observe it from an angle, and often the microscope needs to be refocused. With the DSX100, merely tilt the head to change the viewing angle. The sturdy frame has a low center of gravity, provides extra stability. Change observation methods or image processing with a single touch. Choose the image you want from the previews shown on the touch screen. A few simple steps let you perform the best possible observation very quickly. Now you can operate your microscope just by choosing the image that fits your need. Ensuring the best possible image, whether looking for defects, examining uneven surface or detecting foreign objects. Anyone can operate the system, beginner or expert, with just a touch. Samples may appear differently depending on the quality of material, surface conditions, or illumination methods. The High Dynamic Range (HDR) function of the DSX100 combines several images taken at different exposures to accurately correct brightness differences on the sample surface. HDR provides high-fidelity images that show not only textures but also flaws and defects that were undetectable before. Glare can also be reduced for more comfortable observation. If the non-reflective area cannot be seen, merely increasing the illumination power is often not enough, because glare can occur. Olympus intelligent image processing technology eliminates these problems with WiDER, a proprietary system that works effectively with live images, is ready to go at the click of a button, and takes care of the contrast problems in real time. No blackouts. No glare. The DSX uses long-life energy-saving LEDs for illumination. And because the color temperature is stable, there's no need to adjust white balance. 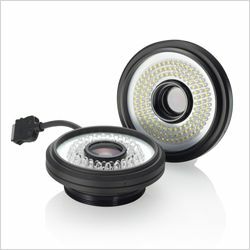 The ring light is divided into quadrants that allow flexible control of illumination, making scratches and defects easier to find. The DSX100 requires no extensive knowledge or special skills to show you exactly what you want to see. By calling on leading-edge electronic technology, you can now see what was unclear or impossible before. On the DSX100 there is no such thing as "outside the field of view." As the stage moves, the system automatically stitches images into a single large field of view, in real time. Where conventional microscopes reduce field area with increases in magnification, the Panoramic View maintains the original field while giving close-up clarity - with 2D, extended focus, or 3D. The DSX100 can easily show your sample in three dimensions, and then you can examine it from any angle. The DSX100 Extended Focal Image (EFI) maintains focus across the entire sample surface area. This makes uneven surfaces easy to inspect. Color enhancement allows you to isolate a particular color while making the rest of the image monochrome. Ideal for focusing on a particular defect. With DSX100, you can perform an observation or measurement, and the system will automatically generate your reports. Olympus guarantees the reliability of DSX Microscope because they are born of Olympus optical and digital technology. Glare is minimized and color reproduction is real. To make sure of that, Olympus uses the perfect combination of CCD chip and graphic board. The sample is reproduced with such accuracy it's like a new dimension. The DSX Series is the culmination of Olympus long history of capabilities as well as proven manufacturing quality. In the clear images produced by the DSX100 opto-digital microscope, you'll find neither flare nor distortion, unheard of in other digital microscopes. The objective lenses were designed and engineered specifically for the DSX100 scope - Olympus offers two versions, a 1x and a 3.6x. Illumination unevenness is virtually eliminated by high level aberration correction. Each lens has embedded LEDs that are designed to achieve optimal illumination from any angle. 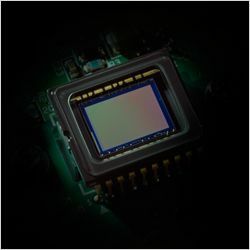 Olympus High Performance CCD is the engine that shows exactly what our high-quality optics reveals. The image shift function ensures high fidelity with fine detail processing, so the clarity extends from corner to corner. Proper calibration is crucial to precise measurements, and with the Olympus DSX100, any operator can calibrate simply and accurately. This eliminates differences that naturally occur when different operators calibrate, and increases the reliability of measurements. In addition, the system's calibration report shows who did the calibration and when. The DSX100 microscope comes equipped with both 2D and 3D imaging capabilities. That means you can measure along the X, Y axis, or along X, Y, and Z axis. Observe, inspect, or measure from any angle.